F. W. Taylor, often called the “father of scientific management” was a mechanical engineer, who in his quest for improved industrial efficiency, laid the foundation of modern day quality management, by emphasizing the need for adopting improved practices and standardization of output. Standardization means that the output is similar and consistent and conforms to what is generally acceptable. It would also mean setting standards or benchmarks and comparing or testing the output for conformity with those set standards and benchmarks. As Henry Ford and Karl Benz in their respective areas of operation also focussed upon mass production with lower cost and increased efficiency, bring process improvement and quality management practices into assembly lines became a growing phenomenon. After World War II, more and more companies in the West initiated mass production with increased efficiency even as they ensured standardization of quality. Thus began the journey of the Quality Model. The Quality Model is a strategy for commercial success that believes that the success of a business depends on understanding and satisfying their customers’ real requirements and in making continual improvements in achieving this result. Even as Statistical Process Control (SPC) was proposed by Water Shewhart, Edwards Deming later developed Statistical Quality Control (SQC) during World War II. 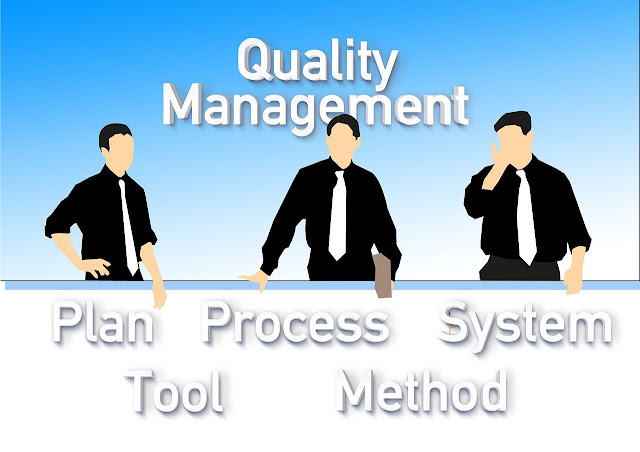 Methods and approaches such as SPC and SQC, Quality Planning, Implementation, and Improvement; Total Quality Management [TQM], were rooted in the Quality Model. All such approaches share a core set of principles, the application of which result in achieving “Quality Goals” and lead a company to extraordinary performance. Post-war, the Japanese made quality improvement and mass production as a matter of national importance in rebuilding their economy and sought the help of the two gentlemen above to define, establish and reinforce the quality imperative. Breaking down barriers between departments, which operated in silos and continuous improvement were two additional principles that were built into the Quality Model. Whereas for the first two decades after the war, Japanese goods were considered to be of inferior quality, thereafter they began achieving high levels of quality, especially after the 1970s. One of the principles of the Quality Model explained above led to the formulation of the CIP or Continuous Improvement Plan which also finds a place in various ISO certifications till date. The House of Quality approach, Kaizen, Zero Defect Program (ZDP) — created by NEC Corporation of Japan based upon statistical process control, the Taguchi Methods, Quality Circle and other highly successful quality initiatives were born, predominantly in Japan. The country that was once scorned for their quality now became the role model for the rest of the world, including the West. The core idea that emerged and stayed through all these Quality explorations was to maximize customer value while minimizing waste. Thus was born LEAN. Simply put, lean means creating more value for customers with fewer resources. A lean organization understands customer value and focuses its key processes to continuously increase customer value. The ultimate goal is a perfect value creation process with zero waste. A popular misconception is that lean is suited only for manufacturing. Not true. Lean applies in every business and every process. It is not a tactic or a cost reduction program, but a way of thinking and acting for an entire organization. The term "lean" was coined to describe Toyota's business during the late 1980s by a research team headed by Jim Womack, Ph.D., at MIT's International Motor Vehicle Program. Six Sigma is a business management strategy originally developed by Motorola, USA in 1986 and is widely used in many sectors of industry. Six Sigma seeks to improve the quality of process outputs by identifying and removing the causes of defects (errors) and minimizing variability in manufacturing and business processes. It uses a set of quality management methods, including statistical methods, and creates a special infrastructure of people within the organization ("Black Belts", "Green Belts", etc.) who are experts in these methods. The term Six Sigma originated from terminology associated with manufacturing, specifically terms associated with statistical modelling of manufacturing processes. The maturity of a manufacturing process can be described by a sigma rating indicating its yield, or the percentage of defect-free products it creates. A six sigma process is one in which 99.99966% of the products manufactured are statistically expected to be free of defects (3.4 defects per million). Motorola set a goal of "six sigma" for all of its manufacturing operations, and this goal became a byword for the management and engineering practices used to achieve it. The Dabbawallas of Mumbai have a Six Sigma certification in a service industry and have been observed to render services with 99.9997% accuracy, thus knocking the belief that academic qualifications are a pre-requisite for establishing quality. Kaizen, Japanese for "improvement", or "change for the better" refers to philosophy or practices that focus upon continuous improvement of processes in manufacturing, engineering, game development, and business management. When used in the business sense and applied to the workplace, kaizen refers to activities that continually improve all functions, and involves all employees from the CEO to the assembly line workers. It also applies to processes, such as purchasing and logistics, that cross organizational boundaries into the supply chain. By improving standardized activities and processes, kaizen aims to eliminate waste. Frugal Engineering or GANDHIAN ENGINEERING is the science of breaking up complex engineering processes/products into basic components and then rebuilding the product in the most economical manner possible. Frugal engineering results in simpler and easier to handle processes and cheaper products with necessary features. Indians and South Asians are known for frugal engineering (Source: Various internet articles). It also results in a much cheaper final product which does the same job qualitatively and quantitatively as a more expensive complexly engineered product. A cell phone that makes phone calls and does little else launched in India for a price below US$20; a portable refrigerator the size of a small cooler; a car that sells for about US$2,200. These are some of the results of "frugal engineering", a powerful and ultimately essential approach to developing products and services in emerging markets. Frugal engineering is not simply low-cost engineering. It is not a scheme to boost profit margins by squeezing the marrow out of suppliers' bones. It is not simply the latest take on the decades-long focus on cost cutting. Instead, frugal engineering is an overarching philosophy that enables a true "clean sheet" approach to product development. Cost discipline is an intrinsic part of the process, but rather than simply cutting existing costs, frugal engineering seeks to avoid needless costs in the first place. At last we arrive at Gandhian engineering. Gandhian engineering is a concept introduced by Tata Motors intended to convey deep frugality and a willingness to challenge conventional wisdom applied to engineering, technological innovation, and new product development. The name originated from India, and was named following the Tata Motors' Nano car conception, a cheap, frugal, low cost and innovative Indian car. It is associated with the sentence "Getting more [services] from less [resources] for more [people]".